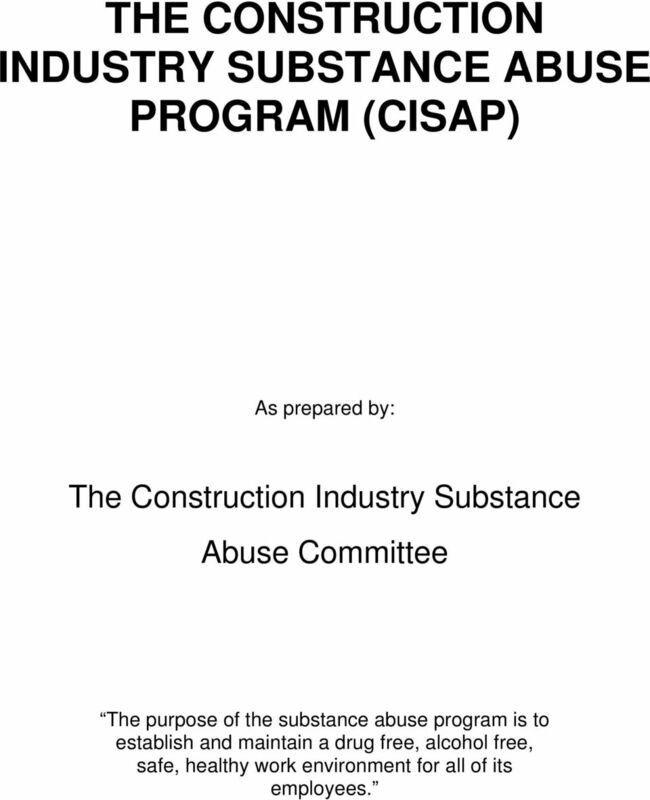 Download "THE CONSTRUCTION INDUSTRY SUBSTANCE ABUSE PROGRAM (CISAP)"
1 THE CONSTRUCTION INDUSTRY SUBSTANCE ABUSE PROGRAM (CISAP) As prepared by: The Construction Industry Substance Abuse Committee The purpose of the substance abuse program is to establish and maintain a drug free, alcohol free, safe, healthy work environment for all of its employees. 3 THE CONSTRUCTION INDUSTRY SUBSTANCE ABUSE POLICY I. POLICY STATEMENT. The Parties recognize the problems created by drug and alcohol abuse and the need to develop prevention and treatment programs. Union & Contractors Association, have a commitment to protect people and property, and to provide a safe working environment. The purpose of the following program is to establish and maintain a drug free, alcohol free, safe, healthy work environment for all of its employees. All tests are for the sole purpose of drug and alcohol screening and cannot be used for any other screening or identifying medical information about the employee. II. DEFINITIONS. a) Accident Any event resulting in injury to a person or property to which an employee, or contractor/contractor s employees, contributed as a direct or indirect cause. b) Adulterated Specimen A urine screening, which has been tampered with to cover the true results. c) Collection Facility/Site Approved location where participants can provide a specimen for testing. d) Company Premises The term Company Premises as used in this policy includes all property, facilities, land, building, structures, automobiles, trucks and other vehicles owned, leased or used by the company. Construction job sites for which the company has responsibility are included. 4 e) Computer Generated Selection Testing (CGST) Third party administrator will select participant to be tested monthly through a computer generated selection process. f) CGST Testing Pool All participating members (labor and management) will be subject to monthly CGST selection. 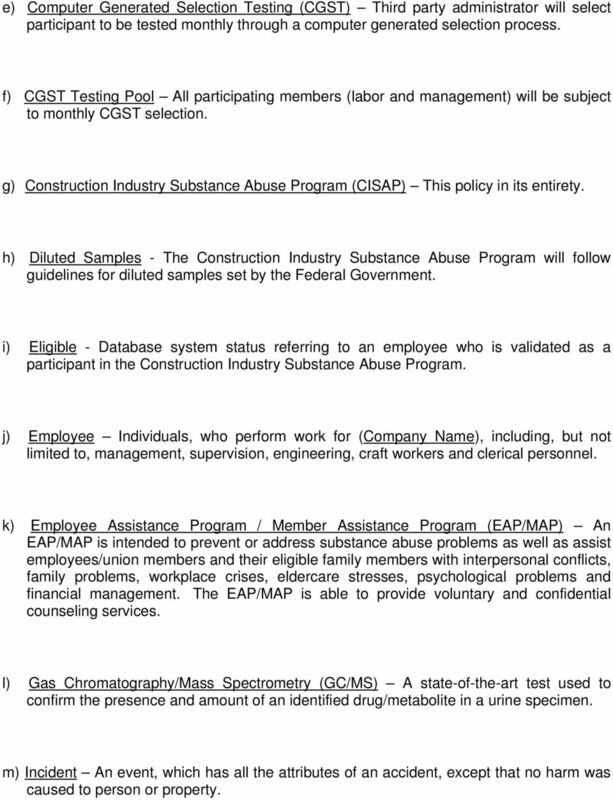 g) Construction Industry Substance Abuse Program (CISAP) This policy in its entirety. h) Diluted Samples - The Construction Industry Substance Abuse Program will follow guidelines for diluted samples set by the Federal Government. i) Eligible - Database system status referring to an employee who is validated as a participant in the Construction Industry Substance Abuse Program. j) Employee Individuals, who perform work for (Company Name), including, but not limited to, management, supervision, engineering, craft workers and clerical personnel. k) Employee Assistance Program / Member Assistance Program (EAP/MAP) An EAP/MAP is intended to prevent or address substance abuse problems as well as assist employees/union members and their eligible family members with interpersonal conflicts, family problems, workplace crises, eldercare stresses, psychological problems and financial management. The EAP/MAP is able to provide voluntary and confidential counseling services. l) Gas Chromatography/Mass Spectrometry (GC/MS) A state-of-the-art test used to confirm the presence and amount of an identified drug/metabolite in a urine specimen. m) Incident An event, which has all the attributes of an accident, except that no harm was caused to person or property. 5 n) Ineligible - Database system status referring to an employee who is not validated as a participant in the Construction Industry Substance Abuse Program. (An ineligible employee should contact the third party administrator or his or her designated representative.) o) Medical Review Officer (MRO) A licensed physician responsible for receiving laboratory results and determining if there is a medical explanation for the presence of drugs/metabolites in the donor s urine. This physician must have knowledge of substance use disorders and appropriate medical training to interpret an individual s confirmed positive test result, together with his/her medical history and any other relevant medical information. 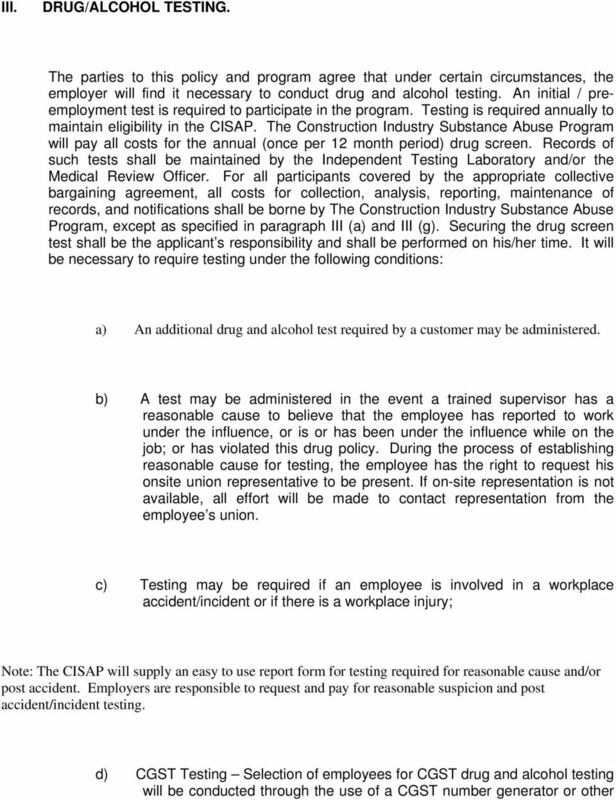 p) Negative Drug Test A test acceptable for employment. q) Positive Drug Test A test, which exceeds the cut-off, limits within the established guidelines developed by the U.S. Department of Health and Human Services. Or a test that has been tampered with in any way (adulterated specimen). r) Prohibited Substances Prohibited substances include illegal drugs (including controlled substances, look-alike drugs and designer drugs) and alcoholic beverages in the possession of or being used by an employee on the job. s) Reasonable Cause Reasonable cause shall be defined as excessive absenteeism or tardiness, slurred speech, alcohol smell, and erratic behavior such as noticeable imbalance, incoherence and disorientation. t) Re-analysis A challenge of a positive test can be requested. Split sample of the original test can be examined by a certified laboratory of the employee s choice. If the reanalysis confirms the positive test, the employee must pay for the analysis. If the reanalysis reverses the result, the program will absorb the cost. u) Return-to-Duty Test Testing required to reinstate eligibility in the program after positive test. The Return-to-Duty Test is taken at the expense of the employee. 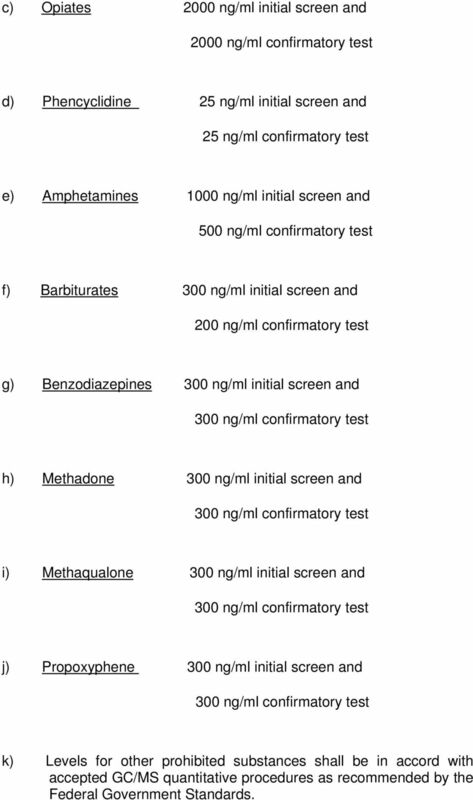 7 c) Opiates 2000 ng/ml initial screen and 2000 ng/ml confirmatory test d) Phencyclidine 25 ng/ml initial screen and 25 ng/ml confirmatory test e) Amphetamines 1000 ng/ml initial screen and 500 ng/ml confirmatory test f) Barbiturates 300 ng/ml initial screen and 200 ng/ml confirmatory test g) Benzodiazepines 300 ng/ml initial screen and 300 ng/ml confirmatory test h) Methadone 300 ng/ml initial screen and 300 ng/ml confirmatory test i) Methaqualone 300 ng/ml initial screen and 300 ng/ml confirmatory test j) Propoxyphene 300 ng/ml initial screen and 300 ng/ml confirmatory test k) Levels for other prohibited substances shall be in accord with accepted GC/MS quantitative procedures as recommended by the Federal Government Standards. 9 neutral selection process. Employees will be selected for testing by a third party agency as determined by The Construction Industry Substance Abuse Program. Third Party Administrator will test a minimum of 25% of the participants annually by CGST. e) Testing may be required as part of a follow-up to counseling or rehabilitation for substance abuse. Employees returning to work after successfully completing a rehabilitation program will be subject to up to four drug/alcohol tests without prior notice or as may be recommended by the testing medical health professional during the first twelve (12) months after returning to work, a positive test will result in further corrective action. f) Testing shall be performed according to the procedures in Section IV. The adulteration or substitution of a sample shall be treated as a positive test. If a sample is found to be diluted, employees will have the option of having one additional test within 72 hours. A second diluted sample may require another type of test; this will be at the employee s expense unless a valid medical reason for the dilute samples is provided. 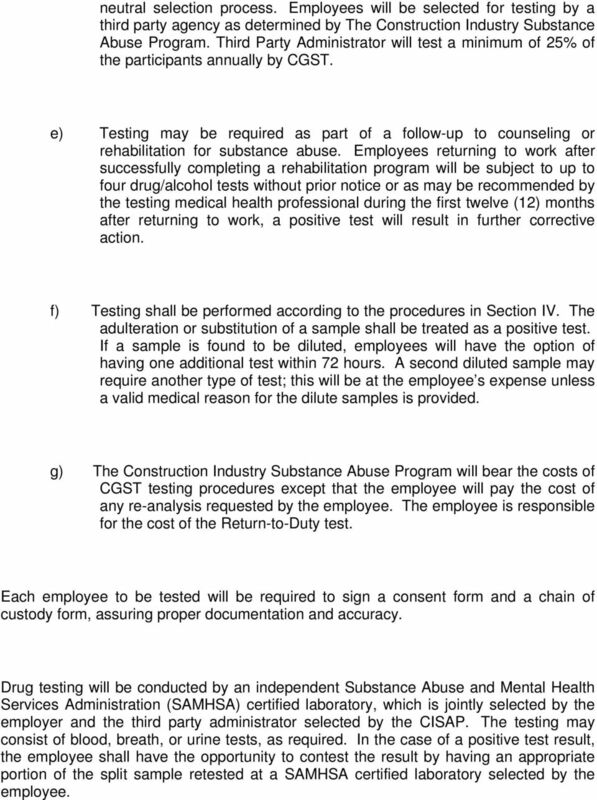 g) The Construction Industry Substance Abuse Program will bear the costs of CGST testing procedures except that the employee will pay the cost of any re-analysis requested by the employee. The employee is responsible for the cost of the Return-to-Duty test. Each employee to be tested will be required to sign a consent form and a chain of custody form, assuring proper documentation and accuracy. Drug testing will be conducted by an independent Substance Abuse and Mental Health Services Administration (SAMHSA) certified laboratory, which is jointly selected by the employer and the third party administrator selected by the CISAP. The testing may consist of blood, breath, or urine tests, as required. In the case of a positive test result, the employee shall have the opportunity to contest the result by having an appropriate portion of the split sample retested at a SAMHSA certified laboratory selected by the employee. 12 a) Individuals testing positive for drug and/or alcohol use under III (a) may be suspended from consideration as required by the customer or facility owner. b) Employees will be required to cooperate with testing procedures and to sign the required consent and chain of custody forms as a condition of continued employment or will otherwise be terminated. c) Employees found in possession of drugs on the work site may be subject to corrective action as provided by subsection (e) (3) of this section. d) Employees found to be under the influence of a prohibited substance, including alcohol, while on duty or operating a company vehicle shall be subject to corrective action as provided by subsection e) of this section. e) The following stages of corrective action shall be imposed: 1) On the first violation of this policy, the employee will be ineligible to work under this program. To be eligible to return to work the employee must participate in a Substance Abuse Education/Treatment Program and provide a negative return to duty test. The SAP must provide written authorization for the return to duty test. 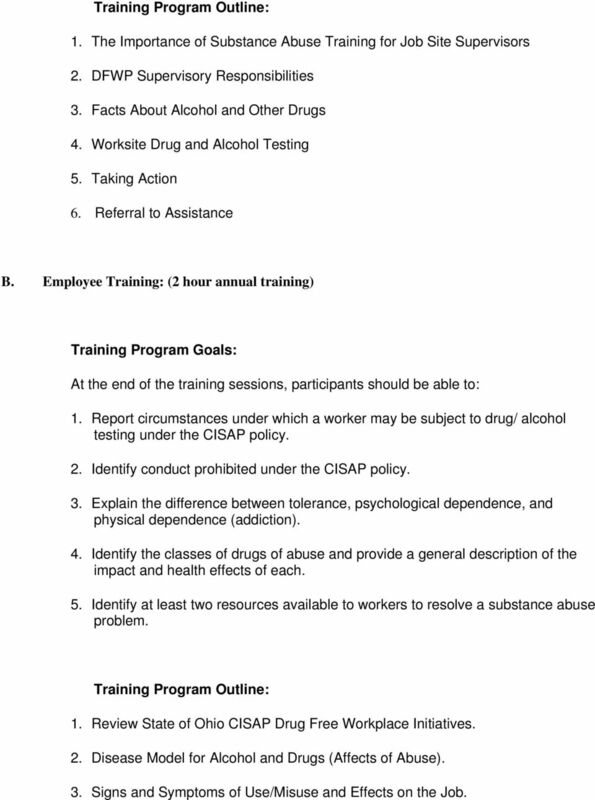 In addition the employee must complete the Substance Abuse Education/Treatment Program. The employee will be subject to CGST testing up to four times over a one year period as a condition of further employment. 2) On the second violation of this policy, the employee will be suspended by the employer for thirty (30) days without pay. To be eligible to return to work the employee must complete a Substance Abuse Education/Treatment Program and provide a negative return to duty test. The employee will be subject to CGST testing up to four times over a one year period as a condition of further employment. 13 3) On third and subsequent violations of this policy, the employer will terminate the employee. The employee shall be suspended from the program for one year. To be eligible to return to work the employee must complete a Substance Abuse Education/Treatment Program and provide a negative return to duty test. The employee will be subject to CGST testing up to four times over a one year period as a condition of further employment. After the one year period the employee can be considered for employment by participating employers. 4) Sale and Distribution. Any sale and/or distribution of a prohibited substance on Company property is grounds for immediate termination. 5) The Corrective Action procedure will revert back to first violation described in Section VI, paragraph 2 (e) (1) following three consecutive years of negative tests providing the employee continually participated in the program. 6) All aspects of this policy and program will be subject to the grievance procedure of the applicable collective bargaining agreements. 14 VII. REHABILITATION AND EMPLOYEE ASSISTANCE PROGRAM Employees are encouraged to seek help for a drug or alcohol problem before it requires corrective action. 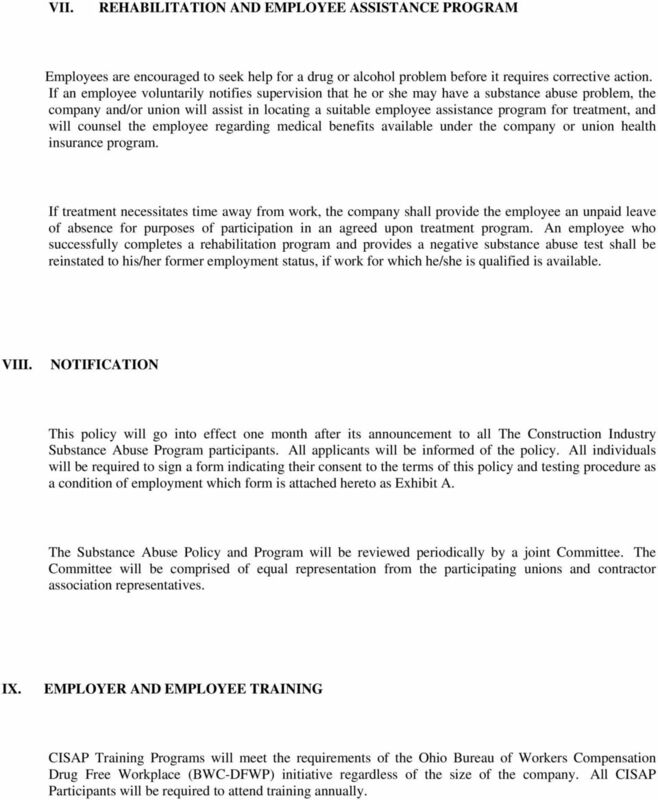 If an employee voluntarily notifies supervision that he or she may have a substance abuse problem, the company and/or union will assist in locating a suitable employee assistance program for treatment, and will counsel the employee regarding medical benefits available under the company or union health insurance program. If treatment necessitates time away from work, the company shall provide the employee an unpaid leave of absence for purposes of participation in an agreed upon treatment program. An employee who successfully completes a rehabilitation program and provides a negative substance abuse test shall be reinstated to his/her former employment status, if work for which he/she is qualified is available. VIII. NOTIFICATION This policy will go into effect one month after its announcement to all The Construction Industry Substance Abuse Program participants. All applicants will be informed of the policy. 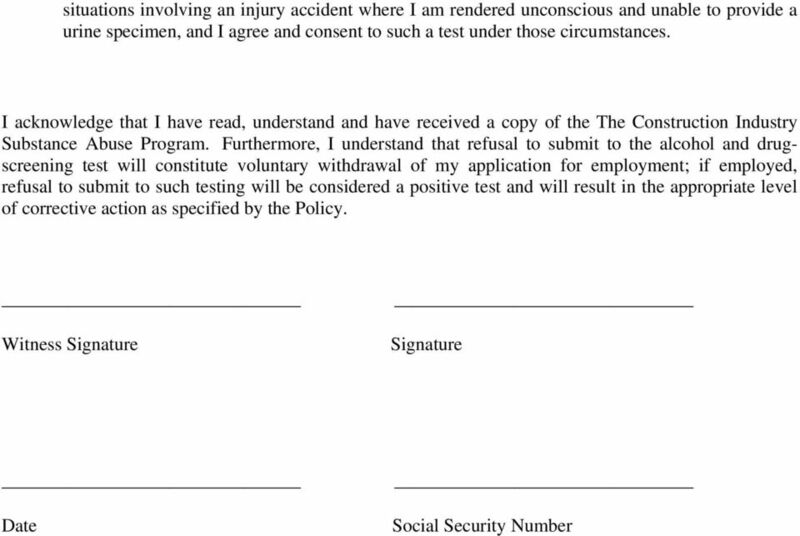 All individuals will be required to sign a form indicating their consent to the terms of this policy and testing procedure as a condition of employment which form is attached hereto as Exhibit A. The Substance Abuse Policy and Program will be reviewed periodically by a joint Committee. The Committee will be comprised of equal representation from the participating unions and contractor association representatives. IX. EMPLOYER AND EMPLOYEE TRAINING CISAP Training Programs will meet the requirements of the Ohio Bureau of Workers Compensation Drug Free Workplace (BWC-DFWP) initiative regardless of the size of the company. All CISAP Participants will be required to attend training annually. 15 A. Supervisor Training: (4 hour initial training 2 hour annual refresher) Training Program Goals: At the end of the training sessions, participants should be able to: 1. Report the current drug and alcohol abuse trends as they pertain to the construction industry. 2. Delineate policies and procedures applicable to CISAP covered employers and associated collective bargaining agreements. 3. Identify the classes of drugs of abuse and provide information about the physical and/or behavioral signs of an individual under the influence. 4. List the appropriate steps for a supervisor to follow if suspicious of a worker being under the influence of drugs or alcohol. 5. Identify at least two resources that employers can refer to for assistance in resolving a substance abuse problem. 16 Training Program Outline: 1. The Importance of Substance Abuse Training for Job Site Supervisors 2. DFWP Supervisory Responsibilities 3. Facts About Alcohol and Other Drugs 4. Worksite Drug and Alcohol Testing 5. Taking Action 6. Referral to Assistance B. Employee Training: (2 hour annual training) Training Program Goals: At the end of the training sessions, participants should be able to: 1. 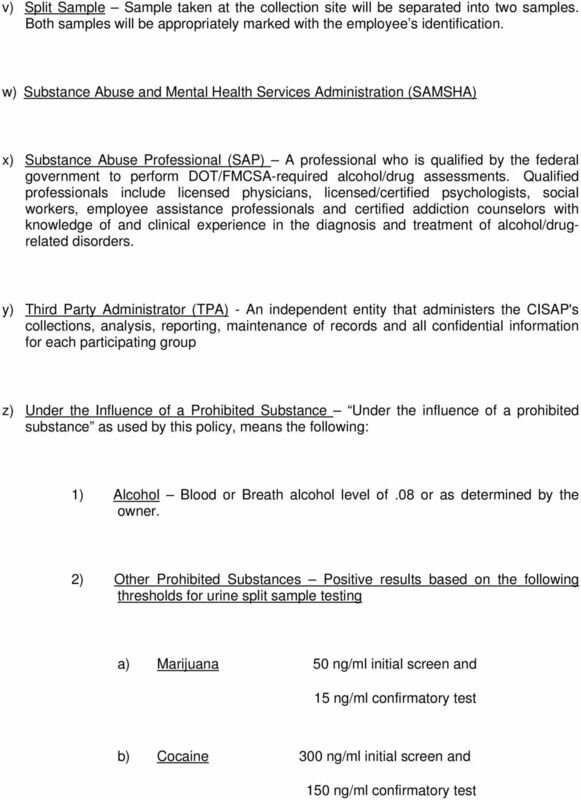 Report circumstances under which a worker may be subject to drug/ alcohol testing under the CISAP policy. 2. Identify conduct prohibited under the CISAP policy. 3. Explain the difference between tolerance, psychological dependence, and physical dependence (addiction). 4. Identify the classes of drugs of abuse and provide a general description of the impact and health effects of each. 5. Identify at least two resources available to workers to resolve a substance abuse problem. 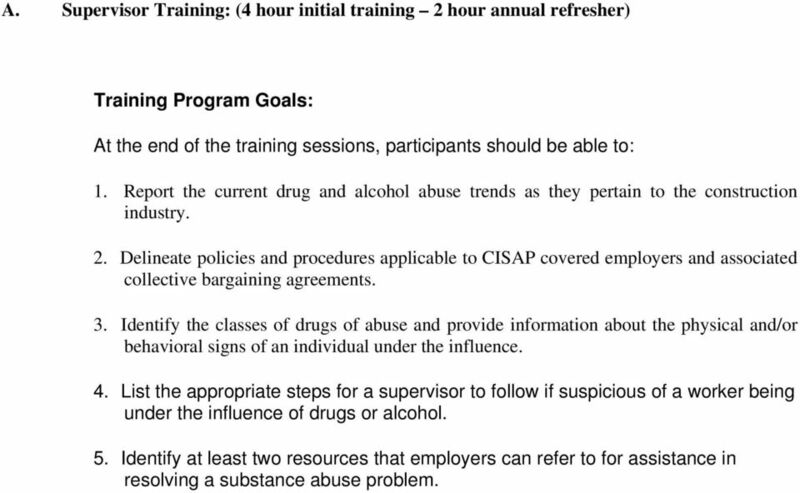 Training Program Outline: 1. Review State of Ohio CISAP Drug Free Workplace Initiatives. 2. Disease Model for Alcohol and Drugs (Affects of Abuse). 3. Signs and Symptoms of Use/Misuse and Effects on the Job. 17 Jvn - 11/06/03 4. 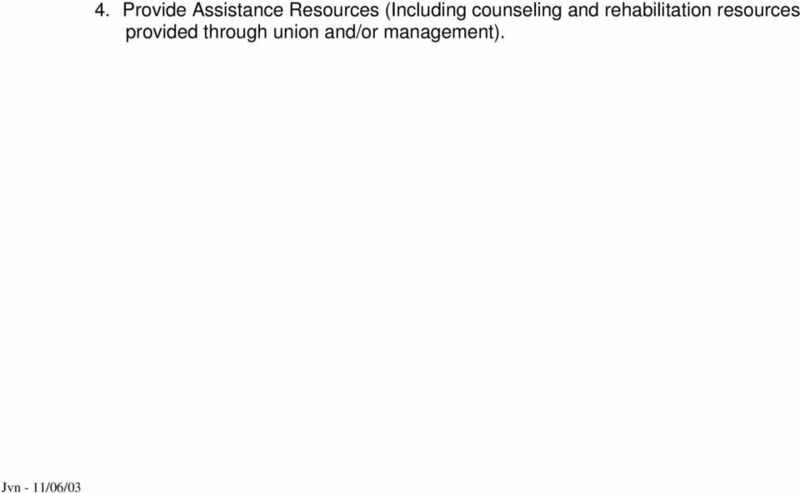 Provide Assistance Resources (Including counseling and rehabilitation resources provided through union and/or management). 20 Appendix 1: Frequently Asked Questions Q1: Who bears the costs for random testing? A1: Under Section III (g) of the policy, The Construction Industry Substance Abuse Program will bear the costs of CGST testing procedures except that the employee will pay the cost of any re-analysis requested by the employee. The employee is responsible for the cost of the Return-to-Duty test. Q2: I ve had a random test; when will I be required to take my next annual test under Section III of the Policy? A2: Following a negative random test, the next annual test must be completed by the 365 th day following the random test. Q3: Who may initiate reasonable cause testing under Section III (b) of the Policy? A3: Testing because the company/employer has reasonable cause to believe an employee is under the influence of an intoxicant or a prohibited substance may only be initiated by a trained supervisor. A trained supervisor is one who has completed training approved by the Construction Industry Substance Abuse Program. Q4: Are all of the thresholds described in Section II (z) (2) identical to those set by the Federal Government? A4: No The Federal Government currently has standards for marijuana, PCP, opiates, amphetamines, and cocaine. The other standards have been set by the Construction Industry Substance Abuse Program using industry standards. Q5: What happens if an employee fails to cooperate in the testing process as required by Section VI (2) (b) of the Program? A5: A failure to cooperate includes, but not limited to, refusing to test, using an adulterated sample, using a substituted sample or otherwise tampering with the test. Failure to cooperate may result in corrective action, including termination. In such instances, there will be a finding of refusal to test or test tampering without a finding that test was positive or negative. 21 Q6: There are a lot of abbreviations in the program description. For example, what does GC/MS really mean? A6: As stated in Section II (l), GC/MS is an abbreviation for Gas Chromatography/Mass Spectrometry. This is a confirmation test considered to be the most scientifically accurate means of ascertaining the identity of a drug in the urine testing process. Q7: Will an employee assistance program actually provide treatment as mentioned in Section VII on the Policy? A7: Technically, no. Employee assistance programs provide short-term counseling and referrals to community resources for treatment. Q8: When are split samples maintained and used in the testing process? A8: Under Section IV of the Policy, Split Samples are used in urine testing and employees have the opportunity to contest the result of a positive urine test by having an appropriate portion of the split sample retested at a SAMHSA certified laboratory selected by the employee. 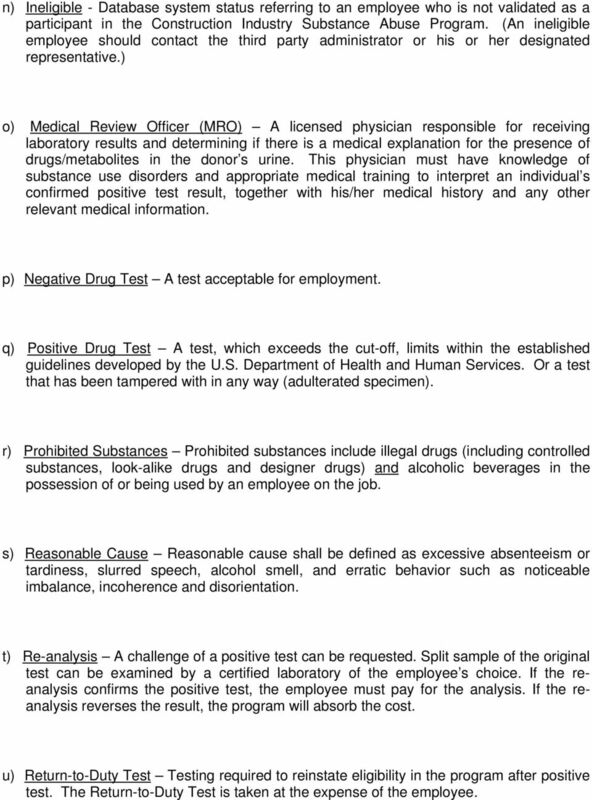 24 Appendix 2: Role of the Medical Review Officer The Medical Review Officer (MRO) will review all drug tests. If a test is positive, the MRO shall contact the worker confidentially to discuss the test results and to determine if there is explanation for the positive result. 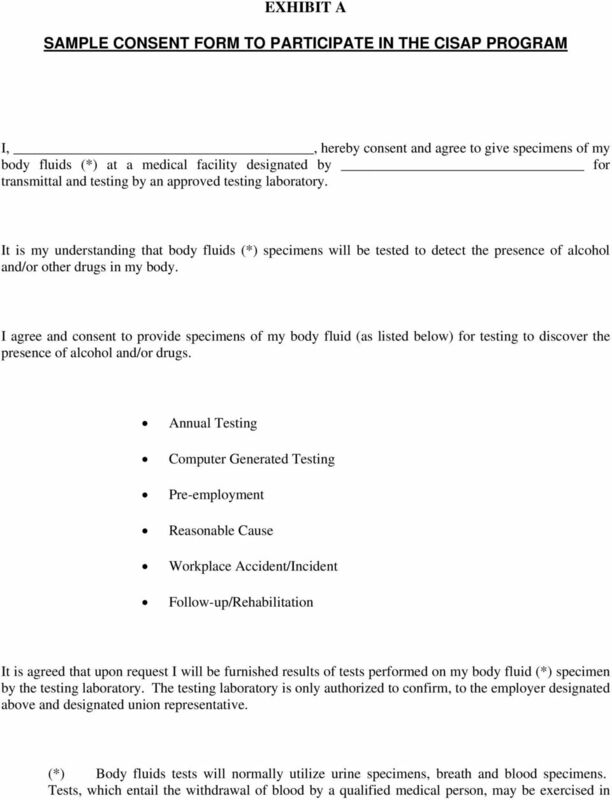 This verification will include conducting a medical interview with the tested worker; reviewing the worker s medical history and any relevant biomedical factors; reviewing any medical records made available by the worker to determine if a confirmed positive test result from legally prescribed medication; verifying that the lab report and assessment are correct; and, if necessary, requiring that the original specimen be reanalyzed to determine the accuracy of the reported test result. The MRO shall inform the worker of his/her right to have the second sample (if the positive test was based on a urine sample) to be tested at the worker s expense at another SAMSHA approved testing facility. If the MRO is not able to contact the worker, the MRO shall report to the Construction Industry Substance Abuse Program that the MRO has made reasonable efforts to contact the worker. Then, the Construction Industry Substance Abuse Program, along with the union for the worker, will contact the worker and ask him/her to contact the MRO within 24 hours. The MRO may verify a test as positive without communicating with the worker if the worker refuses to discuss the test results or more than five (5) days have passed after the MRO notified the Construction Industry Substance Abuse Program of the inability to contact the worker. 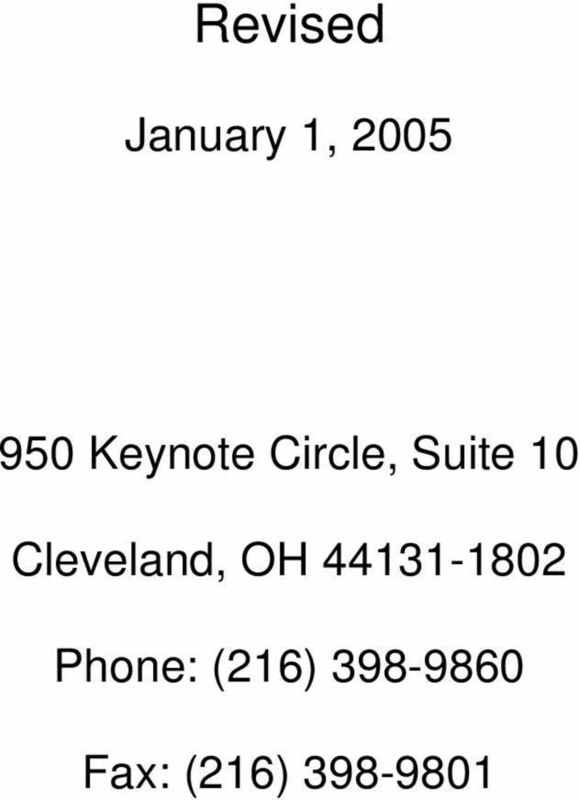 After contacting the worker, the MRO shall report the test results to the Construction Industry Substance Abuse Program s designee providing the following information than the test being reported was in accord with the Program, the name of the worker for whom the results are being reported, the date and location of the test collection, the type of test (pre-employment, annual, random, etc.) and whether the test was positive or negative. All records of testing and verification processes will be forwarded and maintained by the Third Party Administrator (TPA). 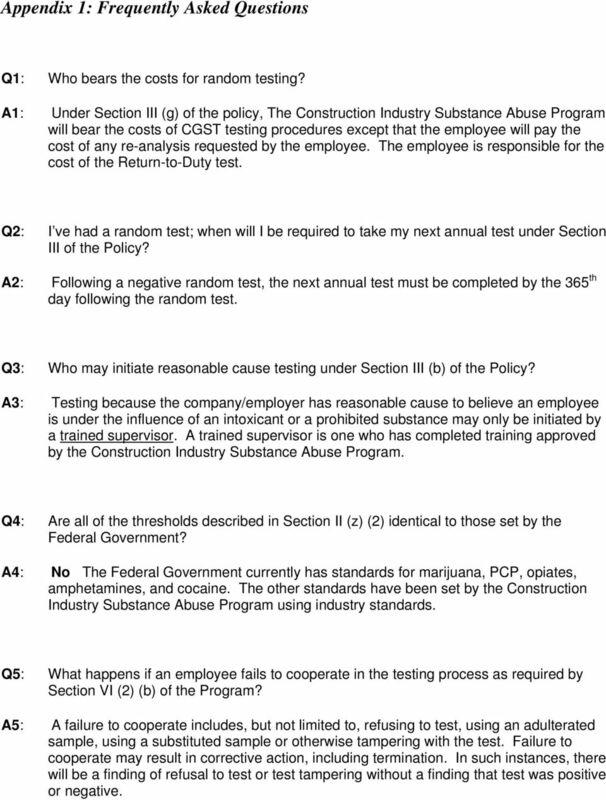 26 Appendix 4: Computer Generated Selection Testing (CGST) The Third Party Administrator (TPA) of the Construction Industry Substance Abuse Program (CISAP) selects individuals for random testing. The goal is to test 25% of the participants of each local annually. The list is selected through a number generator program that pulls by social security number. Once the list is generated it is sent to the Designated Representative. CGST notification letters are then mailed to those selected. The letter outlines all necessary information regarding testing. Once notified a participant has 72 hours to obtain testing. To make testing convenient several options are available. The participant may choose to have his/her collection completed at the group testing site, generally the last date for collection is a Saturday, or at an approved collection facility (a listing of all locations is included with the notification letter). An Authorization for Substance Abuse Testing form is included and needs to be presented at the collection facility along with valid photo identification. The participant is also instructed to take their current Drug Free Card with them to the collection facility and turn it in. A new card will be issued once a negative result is received. This new test becomes the participants Anniversary Date and is good for a period of one year, unless the individual is selected for another random. An individual can be selected more than one time a year for the CGST. The notification letter will state the deadline date the test must be collected by. The CGST is a sensitive test. It is very important to be tested on or before the deadline date. If a participant does not test by this date, they become ineligible in the program and will need to follow the corrective action procedures listed for a positive test. The Designated Representative receives a final report on the CGST results. Those who tested negative remain eligible. Those who did not show up for testing or tested positive become ineligible. 28 a) DRs are encouraged to attend Union Construction Industry Partnership Drug Free Workplace Seminars. b) The TPA will distribute handout to DRs to assist with their responsibilities.